BMI is a very simple measurement which does not take into account the person’s waist, chest or hip measurements. As an extreme example of this, an Olympic 100m sprint champion is likely to have a BMI higher than a couch potato of the same height. The couch potato may have a big belly, not much muscle and a lot of body fat on his hips, upper thighs, in his blood and on other parts of his body. While the athlete will have a smaller waist, much less body fat, and most likely enjoy better health. Using a pure BMI criteria, the couch potato may be considered healthier. 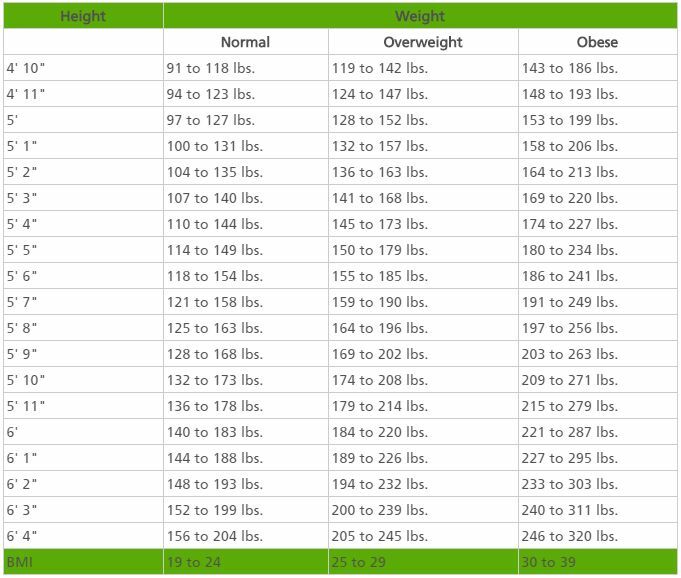 The following weight and height chart uses the National Institute of Health’s body mass index tables to determine how much your healthy weight should be for your height.